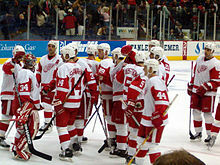 The Red Wings began the 2009–10 NHL season in Stockholm, losing both games to the St. Louis Blues 4–3 and 5–3 respectively. They were plagued by injuries throughout the season and lost the second most man games to injury, with only the last place Edmonton Oilers losing more. The beginning of the season was a struggle for the Red Wings, with key players out of the lineup, including Zetterberg, Tomas Holmstrom, Johan Franzen, Valtteri Filppula and Niklas Kronwall. 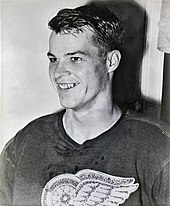 After the Olympic break, Detroit posted a record of 13–3–2 and earned 28 points, the most by any team in the NHL. This run helped them secure the fifth playoff seed in the Western Conference. 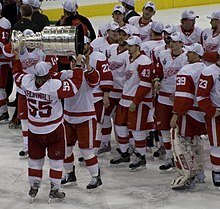 Detroit won their first-round playoff series over the Phoenix Coyotes in seven games. In the second round, they would be defeated by the San Jose Sharks in five games. 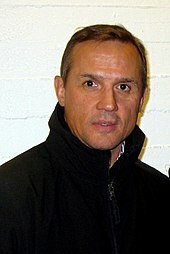 ^ "Steve Yzerman to be named Detroit Red Wings GM, will replace Ken Holland". Detroit Free Press. Retrieved 2019-04-19.